St. Joseph Plantation announces its annual Mourning Tour, October 1st through November 3rd, featuring the customs and rituals of 18th and 19th century Creole Louisiana. The house will be “dressed in full deep mourning”, according to the old prescribed protocol of mourning. In the early days of the 18th and19th Century, the Creoles of Louisiana were predominantly of French, German and Spanish descent. These families, whose parents and grandparents had settled in New Orleans and the surrounding areas of South Louisiana were all Roman Catholic. Their religion was woven deeply into the fabric of their daily lives. On Sunday, buggies were full of families making their way to the various Catholic Parish Churches to attend Mass. Images of Jesus, Mary, St. Joseph and the other Saints were as much a part of the decorations of these homes as the pictures of family members. A Prie Dieu was visible in every bedroom. Morning, evening, and before meal prayers, rosaries and holy candles also made up the patterns of daily life in these homes. In the city and on the plantation, these customs were devoutly followed. 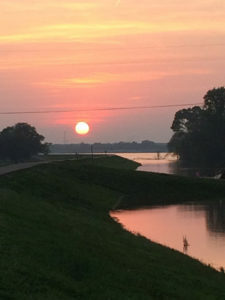 In death as in life, these Catholic families of old Louisiana practiced customs and rituals that were followed for generations by their ancestors. Of course with the much shorter life expectancy of those days, family members were in mourning a considerable amount of their life. A widow would be in deep mourning for a whole year. Black garments were required at all times. Black dress of a reflective nature could be worn but only after the first six months. Children and servants were also required to dress the part. Holy Days were also very important and November 1st, All Saints’ Day, (“La Toussaint”), was one of the most celebrated Holy Days of the year. Weeks before, family tombs were cleaned, repaired, and white-washed in preparation of this much anticipated annual event. On All Saints Day, whole families could be seen visiting their family tombs. Families and friends visited with the living as well as paid respects to the departed. This custom, although modified somewhat by modern life, is still very strong in South Louisiana today. 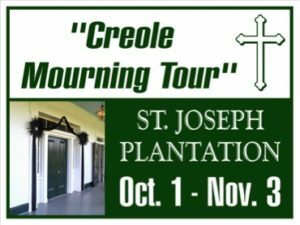 In honor of these important customs and traditions, St. Joseph Plantation is proud to present its Annual “Mourning Tour.” The tour runs from October 1st through November 3rd. 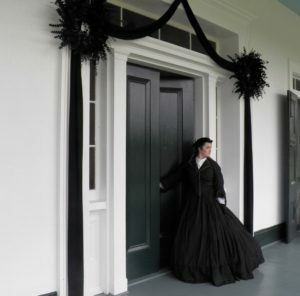 The plantation home is dressed in full “deep mourning”. Black crepe drape and wreath adorn the front doors. Pianos and organ are closed; mirrors covered, white candles and flowers accentuate the black draped coffin which is placed in the main hall as was the old Creole custom of home visitation. Each room of the plantation home is decorated according to these prescribed customs. Incorporated into the regular house tour, St. Joseph Plantation family members and friends explain these old customs and rituals, which are all so very important in understanding the rich history and culture of Old Creole Louisiana and should not be forgotten.. An invitation is extended to all who want to learn and experience the rich history and culture that makes South Louisiana so unique, interesting and loved.